Hot dogs and lemonade served up by local candidates for U.S. Congress were part of an Allen County Right to Life picnic Sunday, billed as the first ever. "We are celebrating all the children of those who advocate for life in Allen County," said Cathie Humbarger, the executive director for Allen County Right to Life Committee. 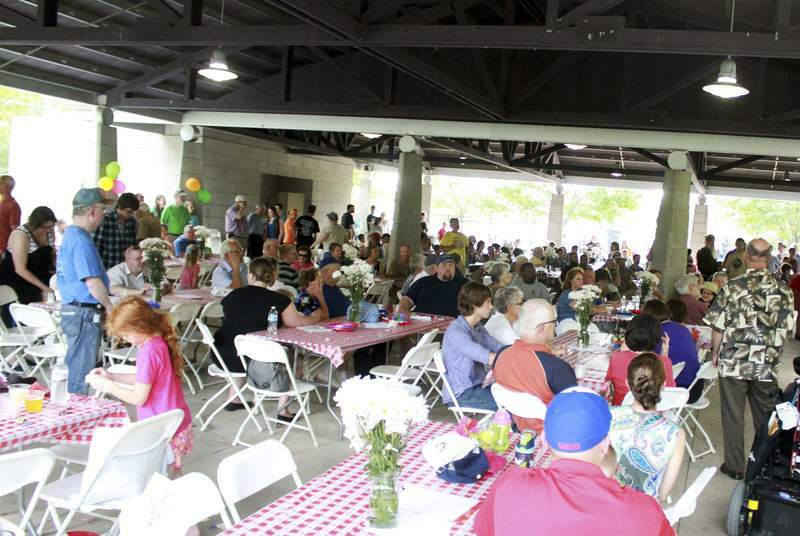 She estimated about 400 families attended Sunday's picnic. Children threw Frisbees, had their faces painted, petted farm animals and ran around the family-style picnic at Headwaters Park West. Singers from Concordia High School sang songs like America the Beautiful and the Battle Hymn of the Republic. And there was an old fashioned cake walk. The picnic, which cost $25 per family, and a fall fundraising event will replace the group's annual banquet, a more formal affair. The Right to Life organization is part of the nationwide network of anti-abortion chapters and has about 2,000 members, Humbarger said. The mailing list is about 10,000, she added. "We wanted to have something that was family friendly and affordable," said Peter Scaer, a New Testament professor at Concordia Theological Seminary in Fort Wayne who is the organization's board president. If family fun was on the menu, so was talk of the Planned Parenthood videos that recently surfaced nationally, allegedly showing Planned Parenthood employees selling fetal body parts. Even though there have been accusations that the videos were edited and doctored, Scaer and Humbarger, among others, said they exposed practices that stray from the law, such as the disposal of baby body parts. "There were six (videos) so far and there are more to come, more horrific," Humbarger said. "People can see that abortion is not something to be hidden behind euphemisms anymore," Scaer said. The Indiana State Department of Health has cleared Indiana's three Planned Parenthood abortion clinics of any wrongdoing related to the national controversy over fetal remains. Attempts to reach Planned Parenthood of Indiana and Kentucky for comment on Sunday were not successful. Humbarger, who is now working half her time for the Indiana Right to Life organization, said abortions are on the rise this year for women who cannot get them in Allen County and go elsewhere to obtain them. "There were no abortions in Allen County," she said. Dr. Ulrich Klopfer performed abortions in Fort Wayne for years but lost that right at the beginning of 2014 after his backup doctor severed ties with him. Allen County law requires that doctors who practice in but don't live in the county have a relationship with a local doctor who can legally practice in Allen County. Also speaking at the event was Father David Mary Engo, superior from the Franciscan Brothers Minor order in Fort Wayne, who walked barefoot at the picnic wearing the same brown sack cloth as his fellow Franciscans. "We wanted to get our membership together and enjoy each others' friendship," Engo said. The gathering attracted families and quite a few Republican office holders and candidates. The three Republicans vying for U. S. Rep. Marlin Stutzman's third district congressional seat - State Senators Liz Brown and Jim Banks and Pam Galloway - were there as was City Councilman Mitch Harper, Republican candidate for Fort Wayne mayor. Betty and Al Olry, members of the St. Therese Catholic Church in Waynedale, were there, not for the politickng, but for the cause. "We're just very pro-life and the term abortion is wrong, it's pro death," Al Olry said. Betty Olry said she had participated in the pro-life March at least twice. "I pray that one day" abortion will end, she said.